If you’ve been one of the faithful users of the Springpad note-taking and bookmarking app, you’ve probably heard by now that the service is shutting down on June 25th. This might leave you scrambling to find a new personal assistant to help you with organizing bookmarks, notes, and lists. 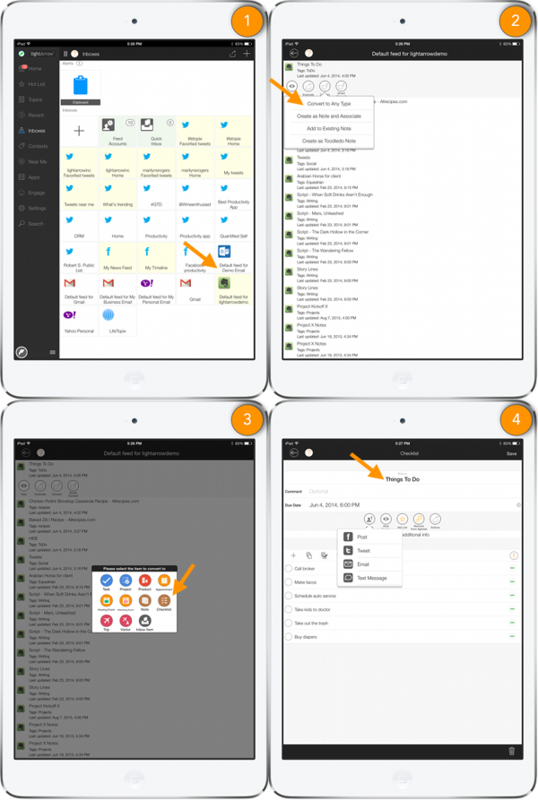 If the functionality you need is the ability to create notebooks, create notes, store lists, and create bookmarks, LightArrow has you covered via its mobile apps for iPhone, iPad, and iPod touch. 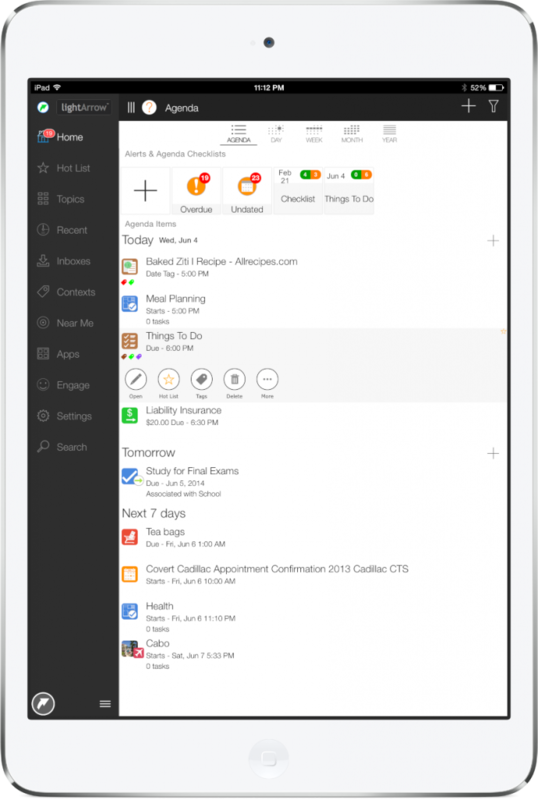 Our apps, LifeTopix, Pro.Inbox or Pro.Notes are excellent alternatives to Springpad for personal and business organization. LifeTopix is our flagship app, which we’ve been developing since 2010. It’s a top app that’s found in the Productivity section of the Apple App Store. LifeTopix is based on 12 life topics, which include Notes + Files, Lists, Bookmarks + Lockers, Tasks + Projects, Shopping + Gifts, Events + Appointments, Travel + Places, People + Services, Health + Goals, Finances, Home + Assets, Education, and Media. If you’re a former Springpad user, you’ll be especially interested in the Notes + Files, Lists topic of LifeTopix, which enables management of local notes, online notes (Evernote and Toodledo), checklists and to-dos, and online and local files (Dropbox, Box, OneDrive, and Google Drive). You can create and organize notes, checklists and to-dos; make drawings and hand-written notes; and add video and audio files to notes. You can create notebooks and easily organize and sort your notes. For items created or synced via the 12 topics, a robust tagging capability is included through “My Contexts.” Categorization is available through tags with tagging permitted for the following types of objects: Appointments, Assets, Audio, Bookmarks, Checklists, Events, Expenses, Files, Gifts, Goals, Metrics, Notes, Persons, Photos, Projects, Reminders, Service Providers, Services, Education Subjects, Shopping Lists, Tasks, Trips, Video, and Visits. Additionally, LifeTopix includes features for managing bookmarks in the Bookmarks + Lockers topic. Specifically, the app includes management of all your web bookmarks, credentials for online services, and other secret data such as PIN numbers, credit card numbers, photos of personal information, and recordings of personal information. Secret data is secure with military-grade 256-bit Advanced Encryption Standard (AES) encryption. Our next update of LifeTopix (8.1), which is due to release in just a few weeks, will make it even easier to work with Evernote. We’ve added the ability to create Evernote feeds. Using an Evernote feed enables you to access your Evernote notes (originally created in Springpad or Evernote) in a list view. 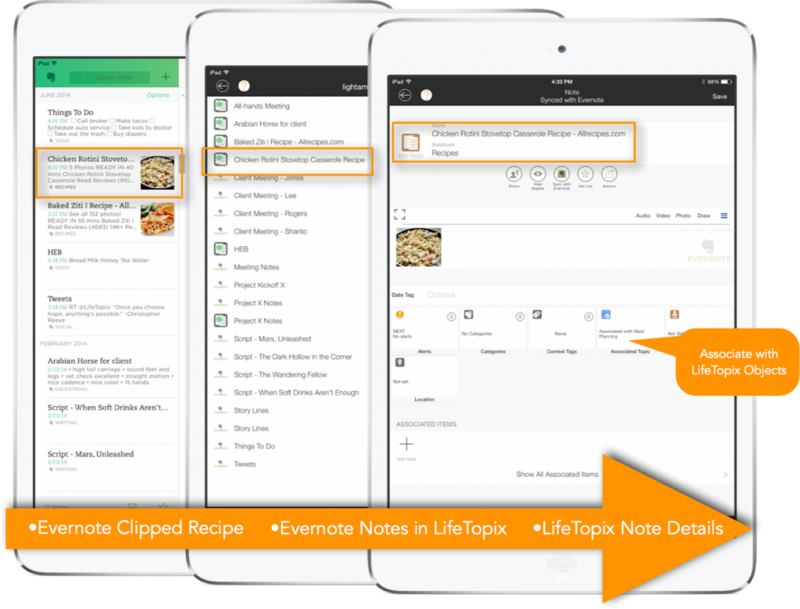 Once you access a note, you’ll be able to convert the notes to LifeTopix tasks, projects, products, appointments, hosting events, attending events, notes, checklists, trips, visitors, and inbox items. Once these items are converted, you’ll be able to associate them with LifeTopix objects and schedule the items on your calendar, which works seamlessly with your iOS calendar and all the calendars that your iOS device supports. For example, as shown below; you’ll be able to (1) choose Evernote from among your email, web, and social feeds; (2) convert a note from a variety of types (including checklists); (3) choose a type of object to convert to; and (4) create an object (e.g. checklist), which can be published on your calendar and agenda (automatically). As you would expect from any excellent personal assistant or organizer, the items that you convert or access through the Notes + Files, Lists topic automatically appear on your calendar (if you wish), as shown below. We currently do not have plans to build an importer for Springpad data; however, you can format your data into a CSV file and import it directly into LifeTopix. This post, Migrate Bento or Other App’s Data to LifeTopix, includes the information you need to know if you plan to import data into LifeTopix from other apps through CSV. Please let us know if you’re a former Springpad user and if you plan to take advantage of LifeTopix to help you manage and organize your personal and work life. We’re happy to offer assistance in your transition. Please comment below. We respond to all submissions. This post includes pre-release images; new features and functionality are subject to change. Is there any ability to clip webpages directly into life topix? Any bookmarklet or similar from the safari browser? That IMO is the biggest thing missing from apps that are trying to replace springpad – either they save web clippings and don’t do much else or they do the notes and lists and planning but they don’t save proper web clippings. LifeTopix has the ability to process any selected text from any Inbox Feed (webpage, email, facebook post, tweet) or any bookmark (in Bookmarks + Lockers topic) opened from within LifeTopix. As soon as you select some text in any of the above, an option to “Process in LifeTopix” shows along with “Copy” option. When you tap on the “Process in LifeTopix” option, you will be able to convert the selected text in to any type of item (Task, Project, Note, Inbox Item, Trip, Event, Product, etc.). Note that the “Process in LifeTopix” functionality requires the in-app purchase of “Pro Inbox Pack”. Should you have any further questions, do not hesitate to contact us again. Any plans to make this to match link on a PC? Mobile is great but I used Springpad on my PC and limited use on my Iphone. We do have plans to support Windows 8.1 in the future. We currently do not have a timeframe set. I would encourage you guys to consider supporting Windows 7 rather than just 8.1 and higher. There are legions of long-time Windows users who are loathe to move to Windows 8 until Microsoft fixes all the horrendous UI design flaws. Even with the latest 8.1 Update 1, most productivity-oriented Windows users are staying with Windows 7. Thanks for reaching out to us! We appreciate the suggestion and will take that into consideration when we release on the Windows platform. Please do not hesitate if you have any further questions or comments. Your app looks great. Do you have plans to develop an Android version for all us non-Mac users? Thank you for reaching out to us, and for your kind words. We’ve been focussing on our big release (recently made available from the Apple App Store) the last few months to get a lot of new func­tion­al­ity and new busi­ness apps out in the areas of CRM, Per­sonal Big Data, etc. We are next focussing on making more progress on our Mac App. And, will focus on Android and Windows 8.1 after that. However, we don’t have a fixed schedule yet.